Mangoes may hold the title "King of Fruits," but pineapples wear the crown. Packed full of vitamins B and C, fiber, manganese and the powerful enzyme bromelain, pineapples provide a fresh tartness that's as delicious in savory dishes as in sweet desserts. Raw pineapples can cause irritation to your mouth and stomach because of the tenderizing properties of the bromelain, so make sure you don't get too much of a good thing by enjoying pineapple fruit in moderation. Pineapples are bromeliads, belonging to the same plant family as air plants and Spanish moss. They are native to Africa and the Caribbean, and are believed to have been brought back to Europe by Christopher Columbus. Most pineapples are grown in Costa Rica and Brazil. One cup of fresh pineapple contains your entire daily recommended amount of vitamin C, according to the experts at LiveScience. Vitamin C is a powerful antioxidant that helps scour your cells clean of the free radicals responsible for the development of heart disease, certain cancers and the visible signs of aging. Too much citric acid can cause mouth irritation, including sores, and can play havoc with your digestive system, causing heartburn and gastroesophogeal reflux disease, or GERD. Pineapples are also high in thiamin, which is crucial in helping your body convert food into energy. High quantities of manganese are also present in pineapples, according to the produce experts at Whole Foods, and it is necessary both in fighting free radicals and in producing energy. The fruit is also low in calories and free of sodium or fat, and fiber is another benefit of pineapple. Fiber helps you feel full and aids in healthy elimination. Dietary fiber can also help keep your bloodstream clear of low-density lipoproteins, or LDLs — also known as bad cholesterol. Read More: What Are the Benefits of Eating Pineapple? To get the ripest, sweetest pineapple, choose one that is yellow-gold in color with large, flat, consistently sized scales, advise the fruit enthusiasts at Well-Being Secrets.com. You should be able to clearly smell the pineapple's distinctive fresh, sweet scent; the skin should be firm, with just a bit of give. Tugging on the leaves is no indicator of ripeness, so leave those alone. Bromelain tends to be more concentrated closest to the pineapple's core, so make sure you trim every bit of core out of your fresh pineapple rings. Another way to avoid irritating your mouth is to cook the pineapple, advises Spoon University. Heat helps break down the bromelain, making the enzyme less aggressive. 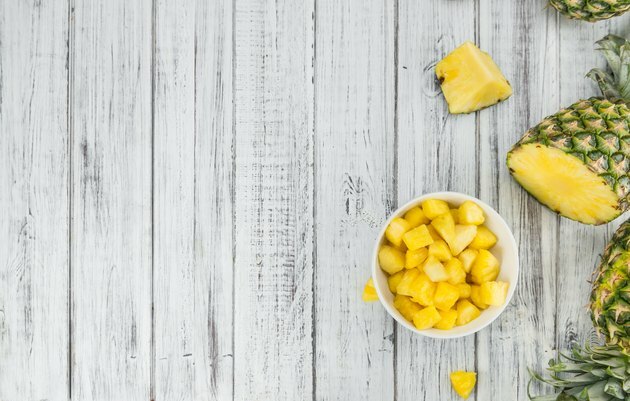 The weight-loss physicians at DietDoc.com recommend limiting your pineapple consumption to no more than 1 to 2 cups per day to avoid irritating your mouth or developing a pineapple allergy. Pineapple juice benefits and side effects are slightly milder than those found in the raw fruit. But the citric acid and bromelain in pineapple can damage your tooth enamel, so drinking pineapple juice before bed can cause problems unless you are careful to thoroughly clean your teeth and rinse your mouth before going to sleep. Read More: What Are the Advantages & Disadvantages of Pineapple? DietDoc.com: The Pineapple Diet - an Effective or Dangerous Strategy for Weight Loss?